A comprehensive and innovative research program is rapidly translating findings to achieve a new era of rehabilitation and hope for recovery in children with paralysis. 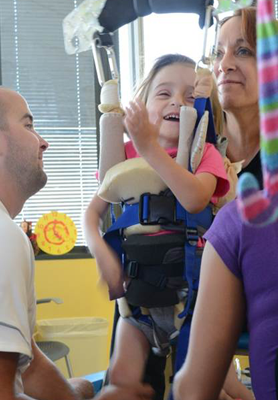 The program’s expert team of pediatric clinicians and scientists are accelerating recovery for young children with spinal cord injuries through their research and clinical applications of locomotor training and activity-based therapies. Cutting-edge treatments are improving short- and long-term outcomes for children, so that they are able to more actively participate in their world, be spared surgeries, hospitalizations and further health complications, and improve the child and family’s quality of life. This program is led by Andrea L. Behrman, PhD, FAPTA and Dena Howland, PhD. Our on-going studies are focused on four main priorities. First, we are seeking ways to improve the effectiveness of our activity-based therapies such that the therapy has an impact on the population of children with severe and mild disabilities. Second, as much of the scientific work has been conducted in adults, we are now developing our equipment for training and testing to meet the specific needs of children. Third, we want to understand the impact of new rehabilitative strategies on areas of particular concern for children with spinal cord injuries prior to age 12, for instance, respiration and cough to prevent pneumonia; spine growth and trunk muscle activation to prevent scoliosis; development of trunk control for sitting, standing, and walking; bone development to prevent hip dislocation. Fourth, we lack good measures to assess recovery in children in particular and thus are developing new ways to assess both recovery and development in children who have suffered insult to their neurological systems. Cardiovascular & Respiratory Laboratory: This laboratory studies the functional impairment of respiratory and cardiovascular systems after spinal cord injury and the effects of new rehabilitative strategies including locomotor training, respiratory muscle training and epidural stimulation of spinal cord. Human Locomotion Research Center: The Center's primary research aim is to understand neural mechanisms responsible for human locomotion and the level of plasticity after neurologic injury. The primary focus is to study the plasticity of the human lumbosacral spinal cord in individuals with spinal cord injury during locomotor training and other interventions.